The Puma SGB Buffalo Hunter is "Hands Down" our most popular selling knife since its introduction in the fall of 2014. The design was inspired by Bob Carpenter with the intent to mix the classic lines of the modified clip point, slightly recurved blade and brass bolster to produce this knife that not only looks great, but feels great in your hand and has the capability to excel in the field. 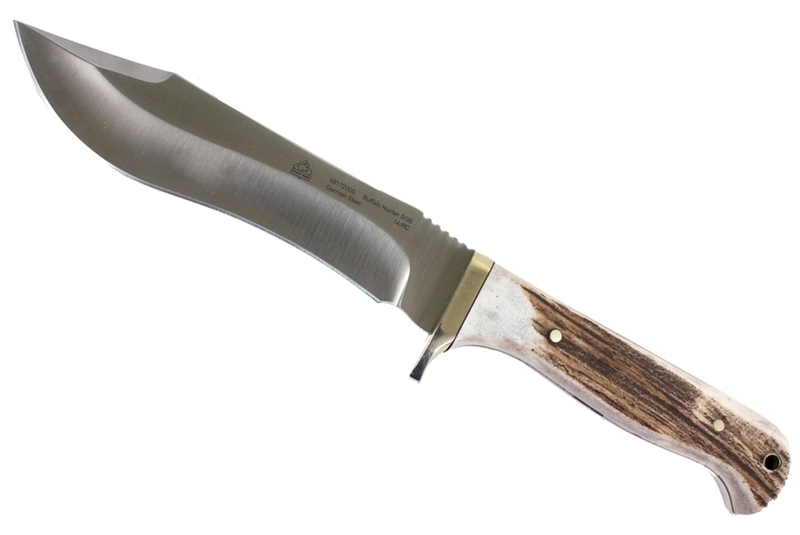 The Buffalo Hunter has an overall length of 10", a blade length of 5.7" and a weight of 7.7 oz.'s. The satin finished blade is made of 4mm 1.4116 German Cutlery steel and has a Rockwell hardness of 55-57. This is a fine knife you will be proud to own and has applications in every aspect of the outdoors, including Hunting, Fishing, Camping, Tactical, Survival and Bushcrafting. Puma SGB fixed blade hunting knives also feature genuine stag handles, brass finger guard and pins, brass lined lanyard holes and large assortment of blade styles made to accommodate any outdoorsman's field dressing or skinning needs. The Puma SGB Buffalo Hunter is available in Stag, Micarta, White Smooth bone, Brown Jigged Bone and Jacaranda wood scale materials. All Puma SGB Stag and Bone handled knives come with top grain leather sheaths that are 100 percent vegetable tanned and feature a rich, durable brown aniline finish that lets the full beauty of the leather show through. Micarta and Wood handled knives come with a ballistic nylon sheath. When it matters, would you prefer German steel or Chinese steel?